A few weeks ago, our church posted some new signs. Welcome banners? Not at all. "Private Property--violators will be prosecuted" and "NO TRESPASSING" are now the first words you'll read when approaching our sanctuary doors. Turns out, a month or two ago some skateboarders (you know, the troubled youth of society) dirtied our front steps with grinding wax. I thought nothing of it. We have skateboarders hanging around our church all the time. But when some others in our congregation saw it they were shocked and irritated. the words "how dare they?!" seemed to reflect the general reaction of at least a vocal percentage of our congregation. So the next week, in swift response, the signs were posted. Now I do not wish to use this platform to directly criticize the actions of our church body and I don't even wish to criticize their conclusion. Sure, if the majority of the church feels threatened or violated in some way from having people hanging out on our front porch during the day, then it's their prerogative to do what's necessary to keep such hooligans away. But I see this as an interesting case study for processing our call to an alternative consciousness. Jesus said, "My kingdom is not of this world. If it were, my servants would fight to prevent my arrest by the Jewish leaders. But now my kingdom is from another place.” Paul wrote, "Do not conform to the pattern of this world, but be transformed by the renewing of your mind." And those are just popular examples from the New Testament, not to mention the entire prophetic tradition and the vast number of narrative examples from the Old Testament of the alternative consciousness of God's Kingdom. As those who have been awakened to a fresh, new, and hidden reality, we cannot live in the world as though things are in reality as they are in the world. The Church is an alternative society--in the world but not of the world. How sad that such a phrase as "not of this world" has been domesticated so as to be displayed on bumper stickers adhering to the windows of a minivans and SUVs. Indeed, its meaning is powerful and transformative. It should challenge our knee-jerk reactions and programmed reflex responses to situations in relationships, political life, property ownership, etc. In the world we have a tendency to respond according to procedure but we're slow to question the implied value systems of said procedure. This is where the signs at our church become and interesting case in point. 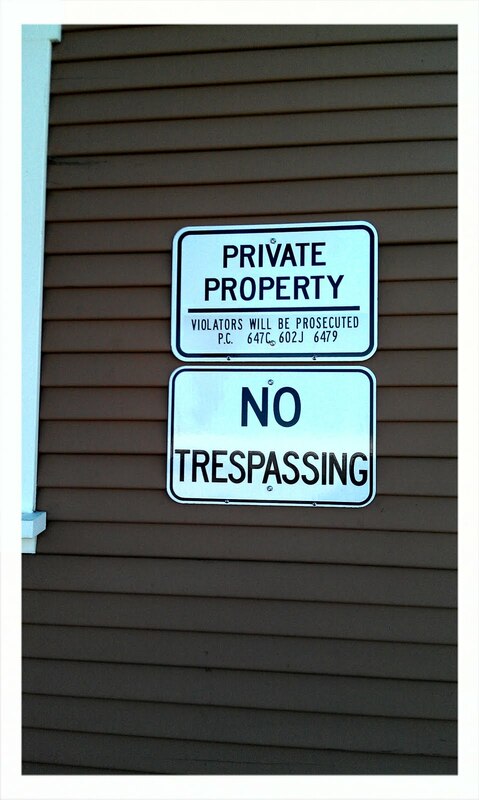 Of course the standard procedure for dealing with "trespassers" is to, first of all, apply the label. When we can legally and justifiably refer to them as "violators" or "trespassers" as opposed to people or guests and when "them" constitutes a particular demographic such as anyone we do not know, we have made the first step toward a standard response. 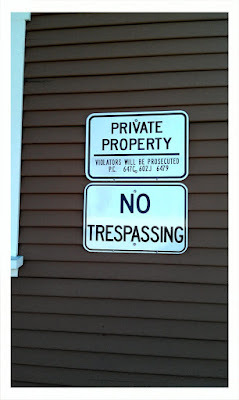 When our property becomes "private" to us, we've made another step. Then all we've got to do is hang a sign and we've done our part. Now we have something to point to if we ever gain the courage to confront our violators. Now, whether or not we should hang signs and protect the property of our church is not the best question. The best question is what standards govern our thinking--the standards of God's alternative consciousness or the standards of the standard consciousness? I wonder if questions of alternative consciousness even crossed our minds when we saw wax on the church steps--questions of hospitality and even compassion. Or did we simply do what anyone else would do if posed with such a problem? When these questions are raised by "NO TRESPASSING" signs, the issue might seem somewhat superficial (I would suggest it's quite a bit more significant when you consider the undermining consciousness or subconsciousness that is created by such signs for an otherwise welcoming church) but what of more substantial circumstances? Do we allow for a prophetic imagination, for the politics of justice and compassion, in questions of U.S. foreign policy or border security? How about in budget disputes? If we are to be in the world but not of it, then we cannot be anything other than a reflection of the transformation that God is implementing into the world. We must dismantle, if only in our own minds, the standard procedures of pivate possession and human segregation and erect in its place an imagination of grace and hope. When God's imagination infiltrates our consciousness and begins to renew our minds, I believe that if our conclusions sometimes stay the same, the questions we ask and the procedures we follow will be hardly recognizable to the patterns of the world. For some of your parishioners, principles regarding property rights and cleanliness are paramount: ‘always keep your area of responsibility clean; if you mess it up, clean it up; leave it better than you found it; if it’s not yours don’t touch it’ and the like. You may never be able to disabuse the value they hold for these principles, but I think it is possible to move from this position to a more Jesus-teaching oriented response without having to make their principles seem wrong to them. c) coerce and restrict (no relationship required). Your parishioners have chosen 2)c); perhaps it is the only option they can see. Then someone such as yourself gets to show them other options, within the framework of their clean/property principles, and without challenging the principles themselves (even if you don’t feel the principles are part of the Jesus teachings). Or you can begin from a position that clean/property principles are not more important than connection/relationship principles (I myself would argue that connection/relationship principles are central to the Jesus teachings, and much more important than cleanliness/property principles). Iin their responses, you will be able to determine principles the skateboard crowd thinks are important. It might be possible to align their firmly held principles with firmly held principles from your parishioners, and then there’s common ground for relationship. Jesus often said to people he met, ‘come and live like I do, and see if there isn’t something of value in it for you.’ A Jesus-teaching approach to these kids might begin in the same place. You can see from what I’ve written, I think response from relationship is much better than response from no relationship. Excellent post. I was checking continuously this blog and I’m impressed! Very useful info particularly the last part :) I care for such information a lot. I was looking for this particular information for a very long time. Thank you and best of luck.